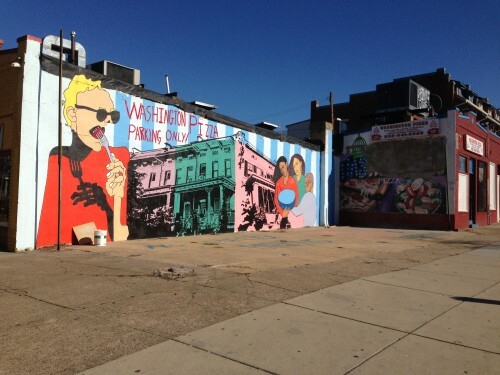 I live pretty much across the street from the cardboard pizza-maker Washington Pizza, so I watched the progress of that somewhat controversial mural. 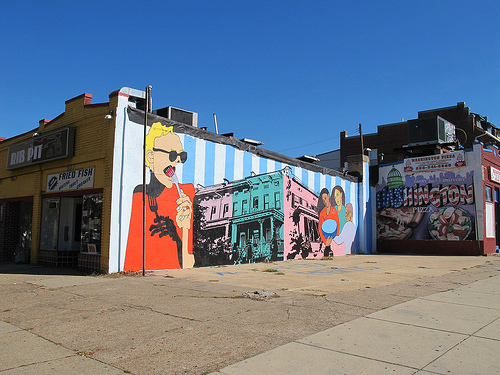 But I noticed that I assume the owner of the pizza place took it upon himself to paint in some open space of the mural: Washington Pizza parking only! In addition to spray painting the area on the ground in front of the mural. I’ve only ever seen a cop park up on the sidewalk there. And I’ve never seen anyone purchase pizza from them. What I wanna know is where the hell does this guy get off defacing a mural with a pointless message like that? How is this ok?